The last Organic-Biochemistry-Nutrition post presented the saturated hydrocarbons, which are familiar as gasolines and other fuels and oils. The first step in getting control of organic chemistry is to be sure you can identify each compound which means recognizing (or assigning) a precise name. From a theory standpoint, these compounds also provide the skeletons for nomenclature of the other classes of organic compounds. 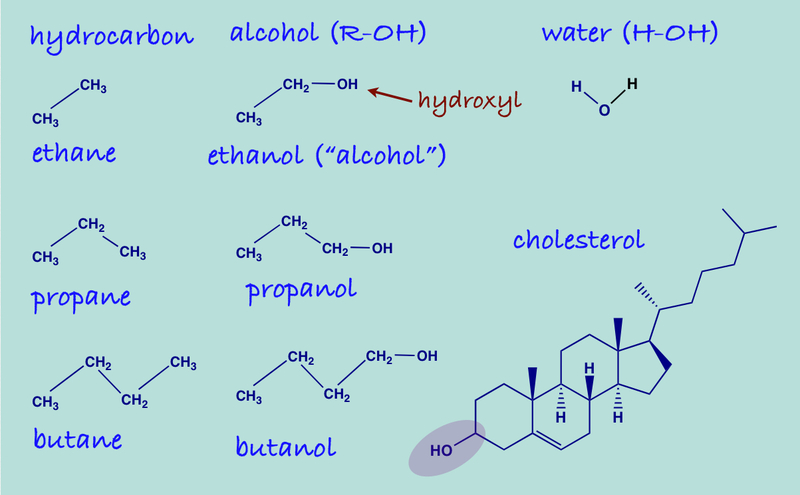 The class of alcohols are those compounds that have a saturated carbon backbone and have one or more -OH groups attached. The simplest alcohol is methanol CH3-OH. Others are shown in the figure from the last post which emphasized that even if the backbone got very complicated, as in cholesterol, it was still an alcohol. The greater the percentage of the molecule that is -OH rather than hydrocarbon, the more they resemble water and the more they behave like water. So, methanol, ethanol and propanol are soluble in water whereas butanol and higher alcohols are not. Looking ahead, however, there are other chemical properties that are common to all alcohols: this is why it is so convenient to lump them together. Draw the molecular formula for hexane. Connect the ends of the molecule by making a carbon-carbon bond. Recognize that now you have a hexagon-shaped objects all of whose vertices are CH-2. This molecule, not-surprisingly, is called cyclohexane. Since you know that all the points are CH-2, you can save time by just drawing the geometric figure. To make sure you have the idea, draw cyclopentane. Now draw a structure with two fused rings: two hexagons sharing a common side. This structure is called decalin (because it has ten carbons). Draw a C at each vertex or intersection. Now fill in hydrogens so that every carbon has four bonds. There should be 8 CH-2 and 2 CH. You can make a complex structure with three fused hexagons and one pentagon, as in the drawing. 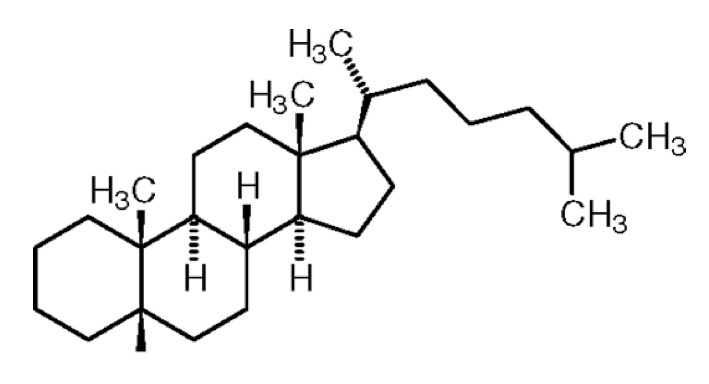 This structure is called cholestane and is the basis of the cholesterol in the drawing. If all this makes sense, Google “cholesterol structure” and click on “Image” in the top menu bar and you’ll see different representations. The arrow is meant to show that the hexane molecule has no rigid structure and could be folded up. The relation to cyclohexane is formal, that is, pictorial. (It is not that easy to convert one to the other in the laboratory). This has defined a new class of compounds, the cyclic hydrocarbons, that, rather than straight chains, are arranged in cyclic structures. Before tackling questions 8 and 9, need to look at one more basic step. The allure of organic chemistry (to those who are attracted to it) is its precision and logic. That’s why an important feature is the name game, giving precise names to organic compounds. The idea is that if you order something from a chemical company, you want to know exactly what you are going to get. Thinking about butanol, now, you might ask what you would call a compound that had exactly the same composition as butanol except that the -OH group was not at the end but rather attached to one of the other carbons. To remove ambiguity in a case like this, the carbons are numbered. There are, in fact, two butanols: 1-butanol and 2-butanol. There is no such thing as 3-butanol because, looking at the structures and remembering that we are trying to represent something from 3-D space, there is no difference between carbon-2 and carbon-3. The big rule for numbering organic compounds: pick a numbering system that has the lowest numbers. Even if, for some reason, the structure is written so that the hydroxyl group appears to be at the far end, you always pick the number so that is the lowest possible. The next figure shows you some examples. Make sure you are happy with this system. More on Hydrocarbons. Branched Chains. The unique features of carbon atoms: the ability to form four chemical bonds and to form chemical bonds with other carbon atoms to form long chains. In addition to long linear chains, carbon can also form compounds with branches. Once you have 4 carbons in a chain (butane)there is more than one way to arrange the carbons. The figure below shows different representations of a compound called iso-butane, an isomer of what we originally wrote for butane. (Isomers are compounds that have the same type and number of atoms but a different arrangement). The straight chain form could be called normal butane, or n-butane but, once there is a precise name for isobutane, n-butane will just be called butane. So, the problem is that there are literally millions of compounds and you can’t have a name for every one. Besides, chemists don’t really like to memorize things and pretty much feel that learning the names of the ten straight chain hydrocarbons should be enough and there must be a logical system for naming organic compounds by relating them to the simpler ones. The system in organic (called the IUPAC system after the International Union of Pure and Applied Chemists) starts from the straight chain hydrocarbons. Every compound is named as if it were derived from one of those. To name a compound, then, find the longest possible continuous straight chain of carbon atoms. For isobutane, this would be 3, that is propane. What about the extra carbon atom? That is assumed to come from a hydrocarbon too but is considered a substituent (substituting for a hydrogen atom), that is, an “add-on” and is given an adjective name “methyl,” and so a systematic name for isobutane is methyl-propane. Similarly, there are two isomers for the 5-carbon hydrocarbon: pentane and methyl-butane. For the 6-carbon compounds vatiation, methyl-pentane, there are two different isomers. Using the rule from the alcohols, the two must be called 2-methyl pentane (never 4-methylpentane) and 3-methylpentane. The examples at the end of this post should allow you to learn how to play the game. A couple of questions are included. Answers will be in the comments and the structures in the next post. To find out what kind of substance they represent, for the simpler ones like isobutane, you can Google them but you should have a sense of power that you can give the precise chemical name for a large number of chemicals. First, two more rules. Hydrocarbon names and substituent names. More than one substituent gets more than one number. If there is more than one substituent, you use the prefix di-, tri-, tetra-, penta-, hexa- and indicate all numbers, even if they fall on the same carbon. You should be able to follow the examples and you should be able to do the questions. For more information or to reinforce what you have here: Drawing organic molecules and Organic structures sites as well as Quiz on naming organic compounds. Also, good intro as part of heavy-duty organic text (skip parts that are complicated). The hydrocarbon chains (and branches) can sometimes be written, like the cyclic hydrocarbons, just showing the geometry. Recall the 3-D convention: a wedge represents atom coming out of the screen and a dotted line, an atom behind the plane of the screen. Here it is. Cholestane is the basic structure. Cholesterol is an alcohol derivative as above. For those who are interested in learning more about drawing, naming and understanding organic compounds I would highly recommend http://www.khanacademy.com They have some great videos on drawing and naming organic molecules plus lots of other organic chemistry info. The video’s are usually under 10 minutes each. Thanks. These are really great. The link above is for the main page where there is a directory apparently allowing you to learn everything in the world. You can scroll down to Organic Chemistry or there area few that directly tie into the blog post. The first assumes a little bit knowledge of chemistry but pretty soon starts at the same level as in the post. The second one starts with naming directly. I recommend downloading the mp3 for ease of viewing. I will update the post with these. Answer: Because at that point the substituent would become the main chain since it would have a longer carbon chain. The other answers require us to type/draw circles with the keyboard. I don’t know how to do that. Q3: 4,5-dimethyl 2-octanol (Always find the longest possible chain regardless of path). Just draw with pencil and paper. Will post answer on next post or some other way. Dr. Feinman, this is a good series and I find it edifying. But my comment concerns other biochemistry. I wonder if you could interest any of your NM cohorts in a study of whether William Lands’ equation for the percentage of n-6 hufa in tissue phospholipids based on diet is predictive for ketogenic diets. I had an email exchange with Dr. Lands years ago and he seemed to imply that he wasn’t sure because there were no datasets for it. I am saying this because your previous blogpost about gourmet low-carb/paleo cuisine had a lot of Omega-6 on the plate, although everything looked delicious. A typical low-carb/paleo-type blogger recommends organ meats, which are loaded with arachidonic acid, some seafood once in a while, almost nothing that has significant alpha-linolenic acid in it, and then poultry and pork which have significant linoleic acid no matter how they are raised.